Organizing and storing all the food items you need to prepare meals at your restaurant or cafeteria can be a massive chore. 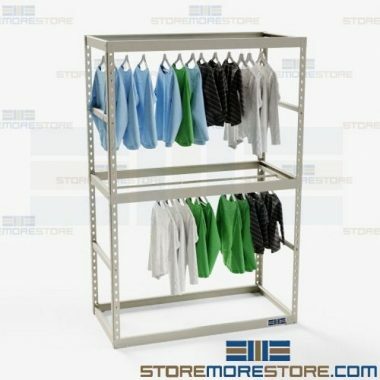 Everything is sized differently, some items need to be refrigerated, and you are always lacking space. 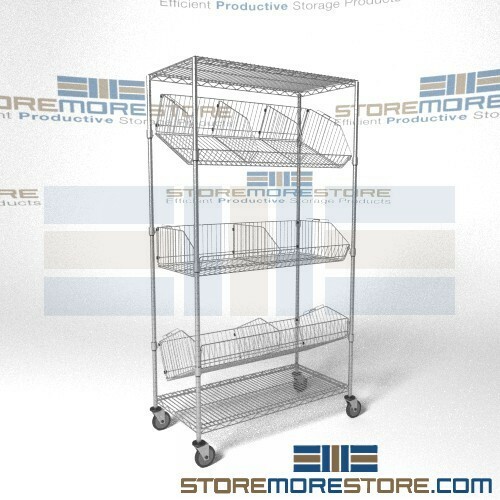 At StoreMoreStore you will find a one-of-a-kind solution for restaurant and cafeteria food storage: lateral sliding wire shelving. Why is Lateral Sliding Wire Shelving Better? 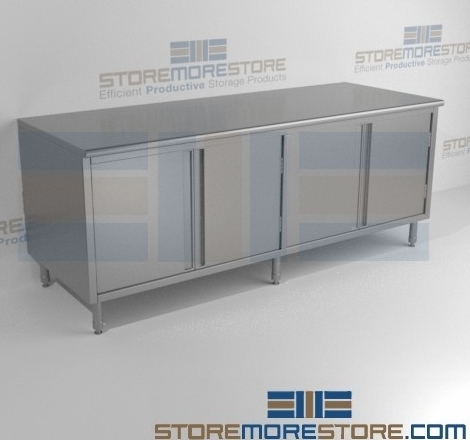 The lateral sliding wire shelving can be used in both dry storage pantries and walk-in coolers. And the shelving will store everything including canned goods, bulk food supplies, wine bottles, refrigerated meats, kegs, beverages, and other kitchen supplies. 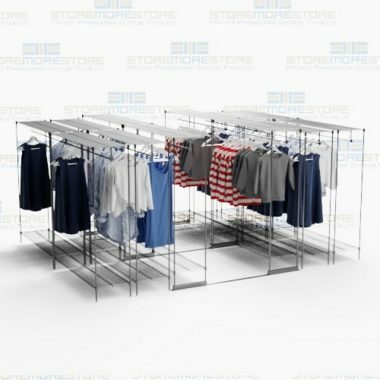 The lateral sliding shelving is just like regular wire shelving, with one major difference – the amount of space it saves. The set-up is unlike traditional wire shelving. Instead of having an aisle in between rows of shelves, the shelving is arranged back-to-back, 2, 3, or 4 units deep. The front wire shelves slide sideways on tracks to give you access to the units stacked behind. 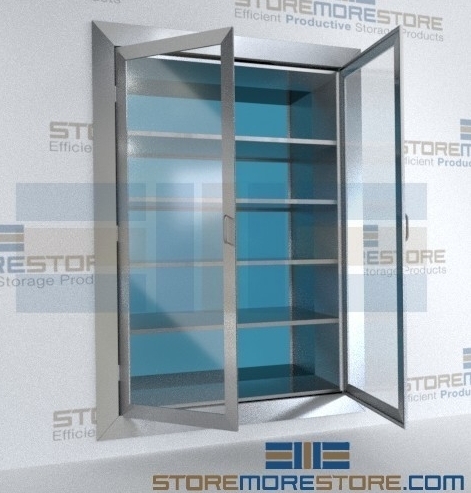 With this set-up, you can greatly increase your food storage capacity while maximizing your space. 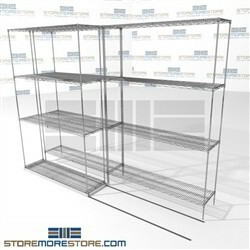 Each system includes the wire shelving, floor tracks, rolling carriages, and hardware. 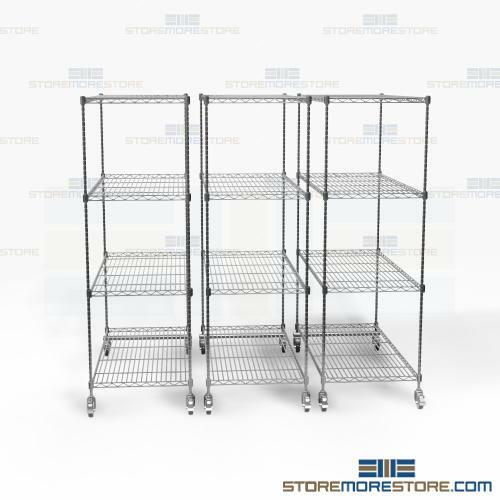 Depending on the configuration you choose (double, triple, or quadruple deep) you will receive one stationary back row and the rest will be the movable shelving. 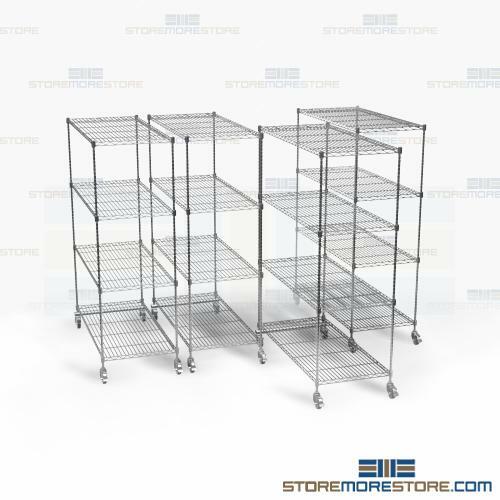 The good thing is that you can buy only what you need now and when your business grows, add a set of tracks with more sliding wire shelving. 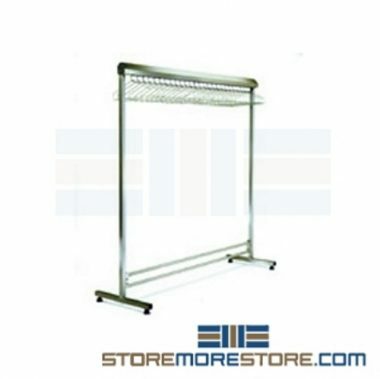 Additionally, all the systems have adjustable wire shelves.And the lateral sliding wire shelving come in chrome with an option to upgrade to rust and corrosion resistant zinc or stainless steel on special request. 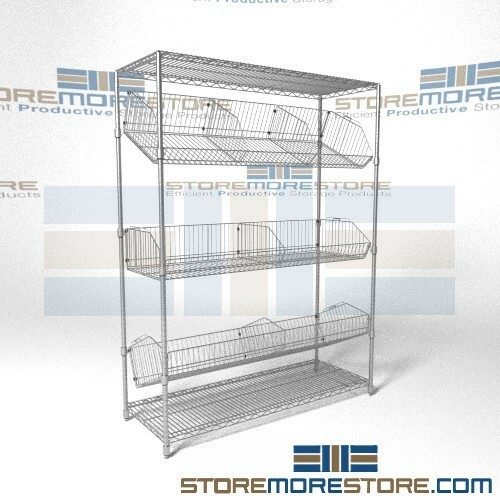 Make food storage in your restaurant or cafeteria more efficient, and shop now for lateral sliding wire shelving from StoreMoreStore. If you have any questions or want to speak with a representative, give us a call at 1-855-786-7667. Medical supplies, sterile inventory, personal protective equipment (PPE), the list of items that are stored in healthcare facilities goes on and on. Making sure there is enough room for everything in addition to keeping certain items sterile can be a full time job. Fortunately, StoreMoreStore has designed a solution to remove that burden from you. What is it? 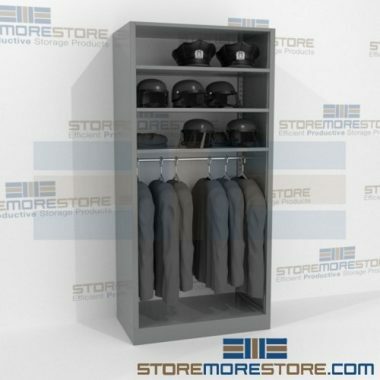 Lateral wire storage shelving. 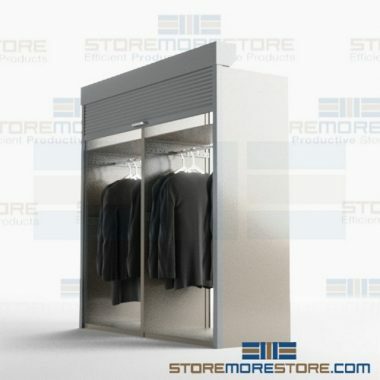 This unique and innovative system will easily and efficiently store medical supplies, sterile inventory, and PPE in less space than traditional storage shelving while helping you maintain a clean environment. 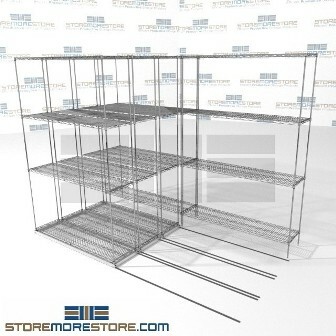 How Does the Lateral Wire Storage Shelving Work to Save Space? 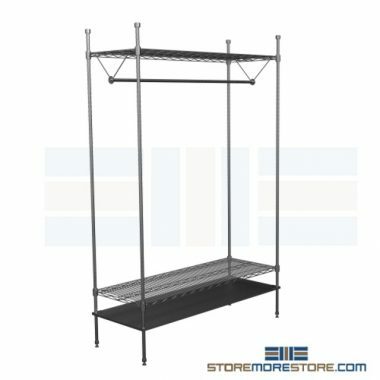 The shelving systems consist of stationary wire shelving units in the back with one, two, or three rows of mobile wire shelving in front. 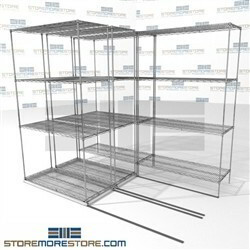 Each type of lateral wire storage shelving includes floor tracks, wire shelving units, rolling carriages, and hardware. Double deep units (two rows deep) come with stationary back units and one set of movable units in front. Triple deep units (three rows deep) come with stationary back units and two sets of movable units in front. Quadruple deep units (four rows deep) come with stationary back units and three sets of movable units in front. The best part is that you can purchase only what you need now to save on up-front costs. When you have additional funding available, you can just add a set of tracks with shelving units. This way you can also try it out first without making a big monetary commitment. 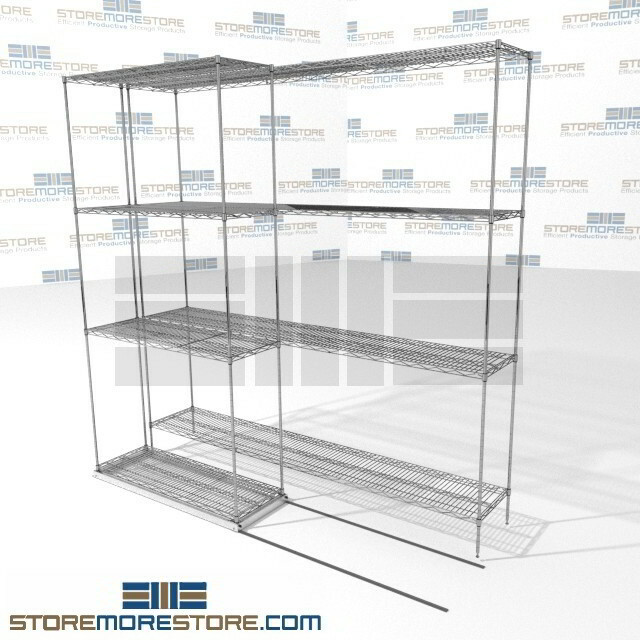 The wire shelves are adjustable, which works great for storing a variety of items. Medical supplies, sterile inventory, and PPE can be stored in a way that works best for your healthcare facility and makes the most out of your space. Speaking of cost-effective, if you need to purchase any medical supplies or PPE, visit our partner store Office Supplies Furniture USA. There you will find a variety of items, all at great prices. Are you ready to make storing medical supplies, sterile inventory, and PPE easy? 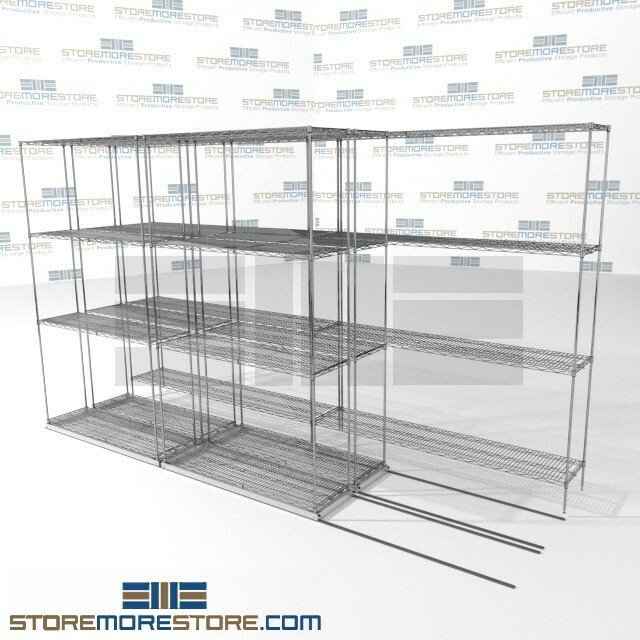 Then, shop online now for lateral wire storage shelving from StoreMoreStore! And if you need any help or have any questions, please give us a call at 1-855-786-7667.